He took a bite (= bit a piece) out of the apple. Here, have a bite of my sandwich if you’re hungry. He took a few bites of the chicken and drank some water. 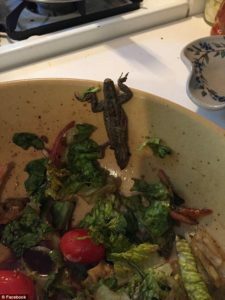 A Maine woman was shocked to discover a dead 3-inch lizard, minus the tail, in her salad. 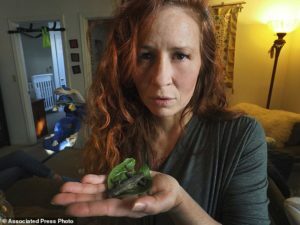 Michelle Carr, a nurse from Kittery, took a couple of bites before sticking her fork in the critter, which she thought was avocado. After vomiting, Carr says she now fears she could have ingested harmful bacteria that her and her newborn son, who is breastfeeding, may be exposed to. Carr said she bought a bag of store-brand romaine lettuce at a Shaw’s supermarket in Portsmouth, New Hampshire, on January 26. A biologist friend believes she found a blue-bellied lizard from California. These mushrooms are poisonous if ingested. The chemicals can be poisonous if ingested. 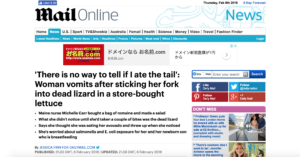 ‘I put my fork into my salad and realized after a couple bites and realized my fork was not in an avocado slice, it was in a lizard. It was disgusting, I was a shock. I immediately started to wretch,’ she told WMUR. ‘There’s no way to know whether or not I actually ingested the tail,’ Carr said. Carr, whose newborn son is breastfeeding, is concerned about salmonella and E. coli exposure for her, and her baby. The school is required to notify parents if their children fail to come to school. Has everyone been notified of the decision? We notified the police that the bicycle had been stolen. It’s a terrible movie and it made $200 million. Go figure! ‘That was very, very scary for me,’ she said. The nurse says she is still waiting on more answers after contacting the New Hampshire Department of Health and Human Services, the Food and Drug Administration and Shaw’s. Carr hopes others will learn from this incident, and not only to watch what you buy, but to be diligent with your food once you get home. The discovery was made after years of diligent research. Leo is very diligent in/about his work. They made diligent efforts to carry out their programs.